Sacred Heart Area School students brought home Carnival Raffle tickets on December 21st. The next time you see a student, be sure to ask for your pack! …if you designate your Target card, or your Best Buy Rewards Zone points to Sacred Heart we get a percentage for all of your purchases? It’s easy to do and it makes a little extra money for the school. One more easy way to give without spending any extra! We are looking for substitute teachers, paraprofessionals and aides at the school with the appropriate training, degree, licensure or certificate for each position. Spread the word, or if interested, please stop by, write, or call the school to apply. Children, thank you for doing such a wonderful job on the Christmas Program, instilling the true meaning of Christmas in our hearts! Thank you Mrs. Trout and Ms. Rinke for great directing, and the rest of the staff in helping prepare the children for the performances! All of us at Sacred Heart Area School are very excited about our new and improved website, which looks great and will be easier for us at the school to update. Our goal is to make it a useful tool for our current families, while promoting our school to future families in the surrounding communities. Thank you Heather Erholtz for bringing us to a more user friendly webhost and creating the new face of the website! This is a great example of how talents shared in our school family makes us all greater. The students of Sacred Heart Area School did a wonderful job on the Christmas program performances of “Christmas All Around” (Preschool and Kindergarteners) and “The Mall and the Night Visitor” (1st-5th). The event warmed our hearts, while instilling in us the true meaning of Christmas! Thank you Mrs. Trout and Ms. Rinke for great directing, and the rest of the staff in helping prepare the children for the performances! May your Christmas Break and New Year be filled with many joys and blessings with family and friends! Enjoy some pictures from the performance. We will add more soon. The SHAS Home and School Association invite you, your family, and all visitors to a Family Cookie Social! Enjoy cookies, coffee, hot chocolate and fellowship with us in the church basement after the Christmas program. Wednesday, December 21st. 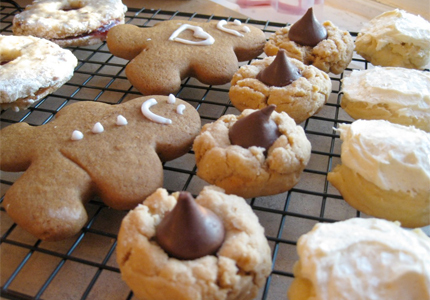 As you bake Christmas cookies please consider baking a few extra to share. Send them to school before or bring them along to the family social. Questions call Elizabeth Mathews at 218-838-8580. Reserved seating for children participating. Children will sit on the right side (facing altar). Thank you Parents for encouraging and supporting your children to participate in mass. The 4th graders have been very busy keeping up with their studies and preparing for the Christmas program. they have received an email. Our focus in science is on ecosystems. We are off to visit the residents at Lakewood Manor on Friday to share our Christmas excitement with them. Wishing you all a Happy and Safe Holiday Season!! God Bless!! 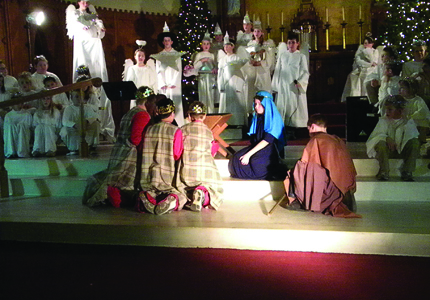 The Sacred Heart Area School Christmas program will be held next Wednesday, December 21st at Sacred Heart Church. Performances will be at 1:30 and 7:00. There will only be one Pre-K and K performance and that will be at 6:30 p.m.